Known locally as the abbey, the multi-period medieval parish church at Kilgeever was built on the site of an earlier Patrician Church. There are several theories about the origin of the name "Kilgeever". It maybe derived from the Irish Cill Chaobhair meaning 'The Near Church'. 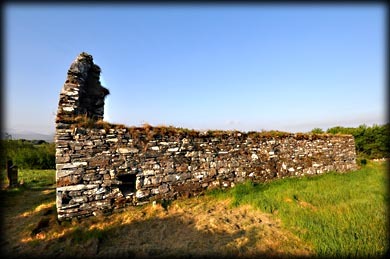 An alternatively theory is that it is derived from "Cill Iomhair" or church of Iomhair. The rectangular building has a narrow round-headed 12th century window in the east gable. 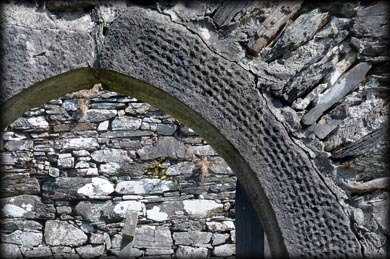 The arch of south doorway is beautifully decorated with pock-dressed stone. There are two aumbries to the eastern end of the interior with votive offerings placed in them. Entering the abbey pilgrims would kneel and say, 7 Our Fathers, 7 Hail Marys and the Creed for the dead. They would then return to the well walking by the stream. To complete the stations they would circle the holy well three times in honour of the Blessed Trinity. Over time some of the customs have been embellished. Modern pilgrims scratch a cross on a 19th century graveslab, that lies in the centre of the church, belonging to the MacEvilly Family. Before leaving they would say a prayer for Henry Murphy of Castlebar, who had the cross erected over the well. Located on the hill behind the church, about 50 metres from the east gable is the beautiful early medieval cross slab, pictured right. There is a Greek style cross outlined on the lower half of the south face. 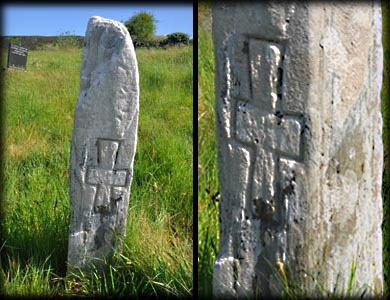 Two 7th century cross slabs, bearing V-shaped incisions, have been removed from the site. I believe one of these two slabs is in a private collection and the other may be on display in Louisburg. I will try to obtain more information on these two slabs. Situated: Three kilometres east of Louisburg. From the main Street in Louisburg head east at the crossroads turning onto Chapel Street. Go 2.5 kilometres and turn right. Then drive passed the new graveyard and turn right. Go down the hill to the old graveyard. Discovery Map 30: L 8363 8070. Last visit May 2017.